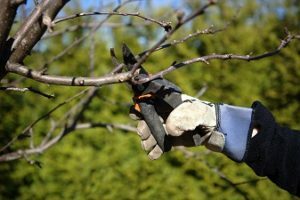 Fruit trees provide you with delicious fruit during the spring, summer, and fall, so it’s important to take care of them during the winter months. Fruit trees provide you with delicious fruit during the spring, summer, and fall, so it’s important to take care of them during the winter months. Winter is the perfect season for taking stock of your fruit trees and deciding what your plans are for the next year. Here are some of our best winter fruit tree care tips! Pull any weeds from the base of your fruit trees to stop insects from burrowing in during the winter months. Once February rolls around, you can add some organic fertilizer into the soil at the base of the fruit tree and add mulch. Mulch will help to insulate the base of the fruit tree and also lock moisture in, ensuring that the tree gets the nutrients that it needs. Overwintering pests can wreak havoc on fruit trees. Aphids, spider mite, and codling moth grubs are known for tucking themselves into small spots in fruit tree bark. You won’t notice them all winter long, but they will re-emerge in the spring if you don’t take care of them now. You should use a winter tree wash to coat your fruit trees and protect them all winter long. It’s safe for animals and children, but will deter any overwintering pests from taking up residence. If you want an extra measure of defense, you can add a glue band to your fruit trees. This band will stop any egg-carrying moths from getting onto tree branches and damaging them. Cold weather is helpful for getting rid of pests, but it can also get rid of delicate fruit trees and potted plants in your yard. Any trees like olive trees or lemon trees should be placed in a greenhouse for the duration of the season. If you have any large accumulation of snow and ice outside, take the time to knock it off the branches. Large amounts of ice can snap delicate branches and stop any chance of fruit growing back next year! This entry was posted on Friday, January 19th, 2018 at 9:35 am. Both comments and pings are currently closed.